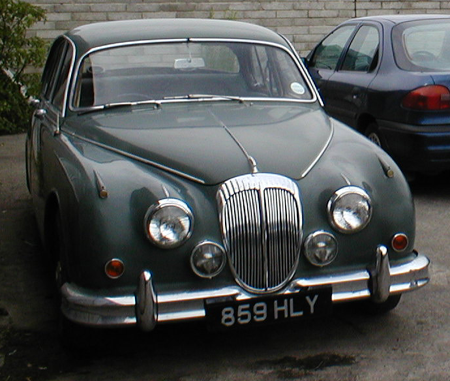 The first Daimler V8 I owned, was a lovely metallic gunmetal colour and looked to be in good order, however the underside was a rotten as a medlar. I spent 140 hours lying on my back, welding in new sills and longitudinal sections. I wished I had never seen the car. 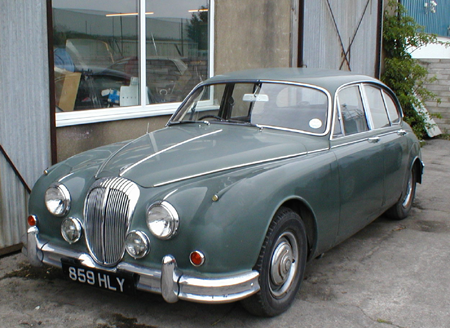 For a few hundred pounds more, I purchased this lovely two owner Daimler. 859 HLY was unrestored and in good original, useable condition. The structure of this car was fine, however there was some rust in the door bottom corners and the trailing edge of the front wings. I cut the rust out and welded in new home fabricated repair sections, a visit to a local paint factor proved very successful, an exact paint match was made. Using an airbrush, I gently touched in the paint, the result was very pleasing, the repairs being invisible and permanent. I purchased new carpets from Coverdale, they were very reasonably priced and easy to fit. 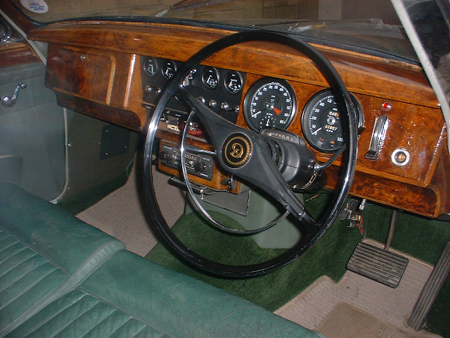 The dashboard responded to a light coat of silk varnish, applied with an artists paint brush. The beauty of owning a car in this condition is that you can improve it as you use it, the car will never be concours, so home repairs may be tackled with confidence. 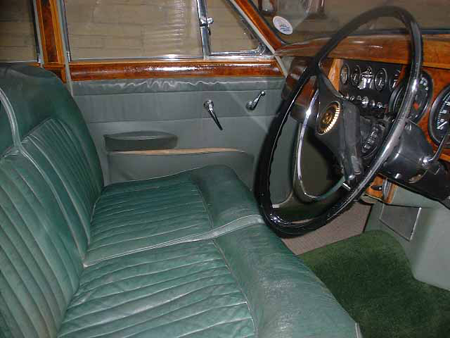 The early version of Daimler’s V8 2 1/2 litre saloon, was fitted with wide bumpers, the later model (see Daimler V8 250), had slimline bumpers, the leather interior on the seating of the later model was lightly perforated and the screen roll and door cappings received a vinyl padded cover. Performance and ride quality are the same as the later car, the values are the same and the best looking of the 2 models is the one you prefer, I cannot choose between them, they both look right. The paintwork was dull but responded well to a good polish, a mid range car like this can be great fun. If buying in this price range be careful to buy an unmolested car rather than a cheaply restored one, it is better to buy knowing how good or bad the bodywork is, a cheap respray can hide some real horrors. This car had not been used for some time, when I first drove the car the gears ‘thumped’ in. I removed the gearbox sump, cleaned the filters and refilled with new transmission fluid, the gearbox performed faultlessly afterwards. If you would like to know more about the Daimler V8 please contact me by submitting the form below.